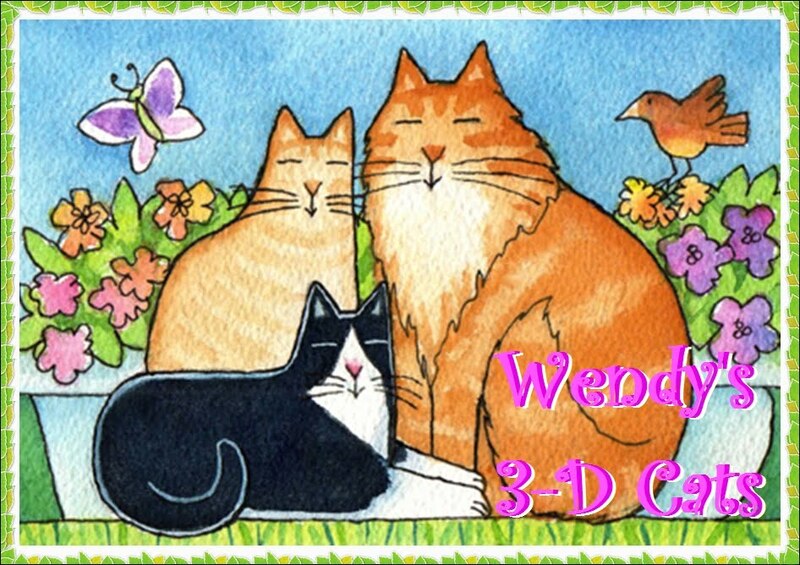 Wendy's 3-D Cats: DOMINO DOES MILO'S BIRTHDAY! Today is Milo Marshall's fourth birthday! As you probably know, Domino is his long-time girlfriend and this year she went all out to make his birthday very special. She also gave him this speed circuit and can hardly wait to try it out with him, herself! 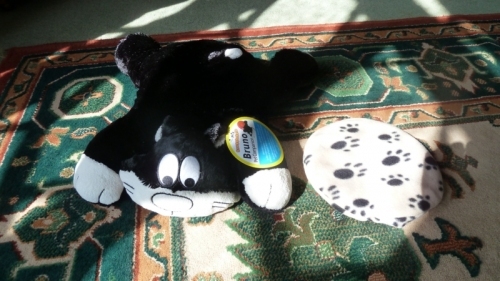 And finally, she gave him this tuxy heatpad so that they can snuggle up together and keep warm. Domino had a tough time deciding what to wear to the party, but finally settled on this pretty frock. "Frock on! ", she exclaims. Domino looks up to her handsome beau. She thinks he's just the bees' knees! Together, they create quite the buzz. So come on over to Milo's party and join the fun. I hear there's lots of food to see -- SEEfood, that is! And of course, it's not just a feast for the eyes -- you can eat it, too. Milo's cake has quite the a-LURE! He wants to have his cake and eat that, too! 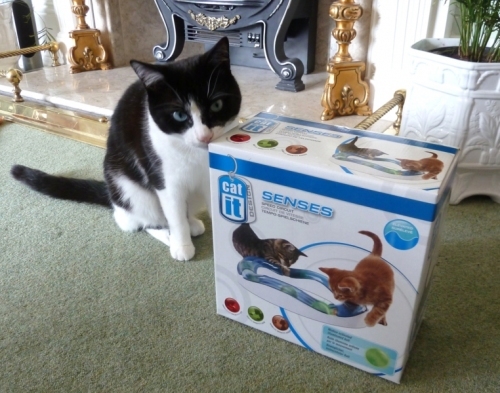 Milo is going to be overjoyed with the lovely party and presents from you Domino. He is lucky to have such a loving girlcatfriend. Oh Domino, you sure did give Milo so many great birthday presents. 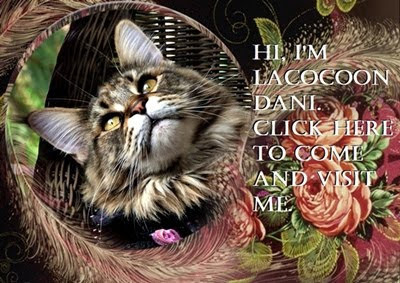 The card is just terrific. We love that frock too. Two Two needs so much more practice with her modeling. Can she come there for some lessons? That toy you sent to Milo looks terrific too. 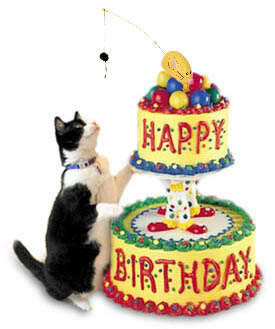 Hope all of you have a fun day celebrating Milo's birthday. You are his special sweetie and he sure loves you too! Happy Birthday Milo! 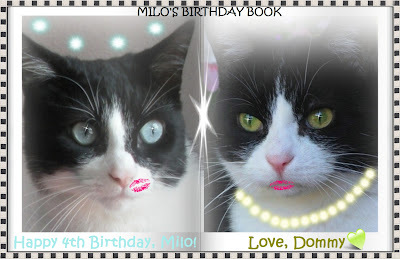 What a wonderful birthday post for ~ fanks Dommy! Milo is one lucky mancat! THey are a very cute couple! You're going to sweep him off his paws! Wow Domino! Yous sure knows how to treat a guy! Me would not do that....but me would not mind if somebody did it for me. We bet Milo loves all his presents, Domino! Wow what a great party for Milo!! !